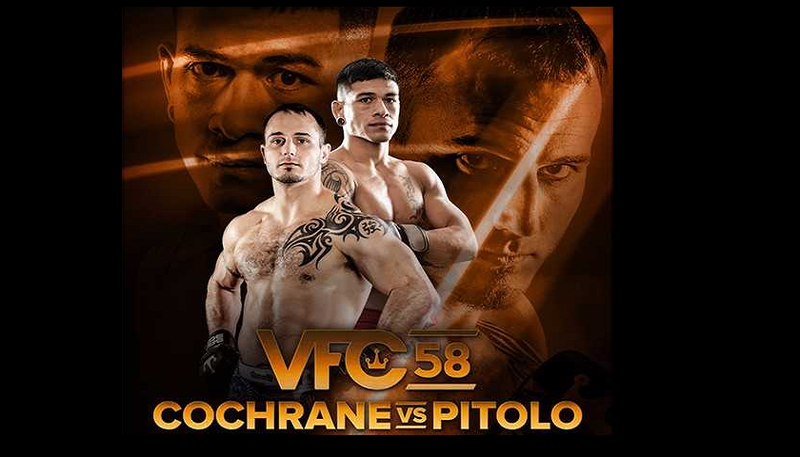 A main-card lineup of eight fights has been announced by Victory Fighting Championship for its VFC 58: Cochrane vs. Pitolo event set for Saturday, July 22nd at Baxter Arena in Omaha, Nebraska. The card is topped by clash between welterweight standouts Dakota Cochrane and Maki “Coconut Bombz” Pitolo, and will air live on UFC FIGHT PASS® beginning at 10 p.m. ET / 9 p.m. CT / 7 p.m. PT. Tickets for VFC 58 are available at www.ticketmaster.com. Plazola (14-6) has won three of his last four outings, including first-round finishes of Anthony Baccam via knockout at VFC 51 and then Nick Bartels by submission at VFC 53. Just two weeks after his victory over Bartels, the Waterloo, Iowa, product notched a split-decision verdict over Peter Petties at VFC 54. Martinez (40-17-1) is one of organization’s long-time standouts, having gone 11-3 under the VFC banner. The 33-year-old, who will have plenty of home-town support fighting in Omaha, will make his 15th appearance with VFC having won three of his last four bouts, all by inside the distance highlighted by a 30-second knockout. The 14-year veteran has faced several notables during his career including Clay Guida and Yves Edwards. With his quick win over Justin Overton at VFC 57, Minner (18-6) continues to be red-hot having come out on top nine of his last 11 bouts. The 27-year-old Nebraska City, Nebraska, native has posted a staggering 15 first-round submission finishes. Shutt (20-21-1) has won three of his last four trips into action, all three coming in the first round. The 32-year-old veteran from Creston, Iowa, boasts a career-highlight victory over current VFC cageside analyst Joe Wilk coming via a first-round submission in 2014. Now in his seventh year as a pro, Land (14-9) is looking to put a halt to a three-fight skid. When things are going right for the 26-year-old from Brady, Nebraska, he is a quick finisher having racked up his last three victories inside the distance. Kansas City’s Latchman (5-3) will be looking to rebound following back-to-back hard-fought decision losses. Prior to those defeats, the 22-year-old had racked up four consecutive knockout victories, one of which came just 23 seconds into the contest. A 26-year-old product of Crystal Lake, Illinois, Galloway (9-7) has split his last four trips to the cage with both of his wins coming in the first round. Almond (3-2), who will be fighting in front of his home-town fans in Omaha, lost by knockout to Arnold Berdon at VFC 54 but rebounded quickly by scoring a first-round TKO of his own against Tony Ortega at VFC 56. A first-round submission victory over Will Shutt at VFC 57 in April lifted Logan (6-2) to a three-fight winning streak and a winner in five of his last six. The 27-year-old from Sioux Falls, South Dakota, scored a sensational first-round knockout of Robert Ostovich back at VFC 54. After coming out victorious at VFC 47 thanks to a 32-second submission over Sean Wilson, Carrillo (11-15), who hails from Wichita, Kansas, has since lost decisions at VFC 50 and 57. Medina’s lone victory was via a first-round submission, and the 23-year-old (1-1) from Waterloo, Iowa, returns to action for the first time for the first time in over a year. Nawrocki (1-0) went an impressive 5-1-1 during his run in the amateur ranks. The 25-year-old ventured into his pro debut and scored a second-round submission win over Nick Radtka at VFC Fight Night at Harrah’s 4. Just 19, Molina (0-1) is a blossoming talent who claimed the VFC amateur title last December with a third-round submission victory. The Kansas City, Kansas, product went 5-0 as an amateur with three of those wins coming inside the VFC square cage. He will be looking for redemption after hitting a bump in his pro debut when he dropped a submission verdict at VFC Fight Night at Harrah’s 5 last month. After 16 fights in the amateur ranks including two with VFC, Benitez, who fights out of Grand Island, Nebraska, makes his much-anticipated pro debut at the age of 24.